From The Latest Album Stand Up, Forward, March! 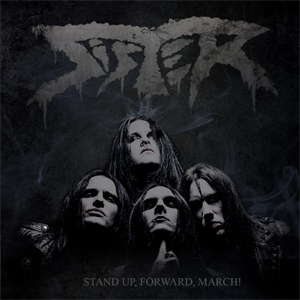 The Swedish sleaze/punk influenced metal outfit known as SISTER, who hail from Stockholm, Sweden, has been working hard during the last ten years earning the reputation of being one of the best live acts out there. Now, SISTER has launched a new video for the song "Endangered Species", taken off their latest album, Stand Up, Forward, March!. Watch "Endangered Species" on KNAC.COM right HERE. SISTER's Cari Crow comments: "We went to the dirty streets of London to shoot the video for "Endangered Species". The video touches the current mode in today's rock n' roll scene but also reflects the contrast of people living in large cities. We wanted to capture the raw reality and London was the right place to connect these two themes. We once again worked with Rene U Valdes and Greenworks Television and they really captured what we wanted to show."